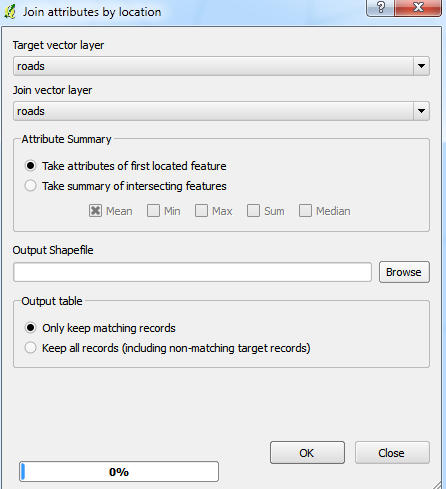 Joining attributes from nearest point in QGIS? I have two layers with points, call them A and B, each with different attributes. For each point in A I want to join all the attributes from the nearest point in B. Ideally this would also include a field measuring the distance between both points. I know how to so this in ArcGIS: right click layer A>joins and relates>joins, then join data based on spatial location and choose to join attributes from nearest point. I could not find similar functionality in QGIS. Any pointers? Using "Distance Matrix" you can calculate the nearest point. Make sure that both layers are in the same CRS! 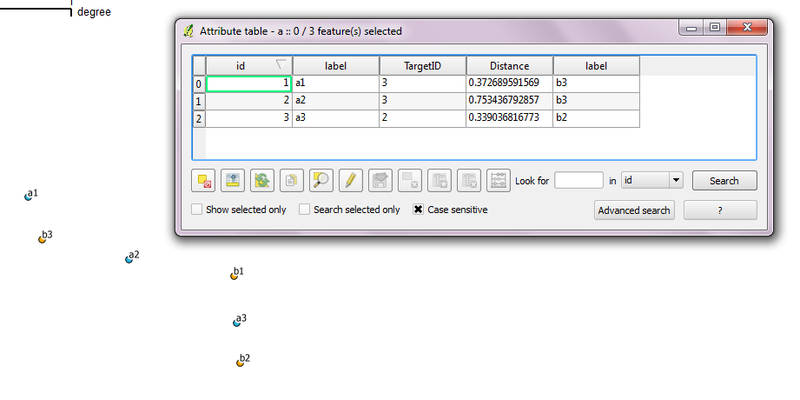 Then, you can load the results and use them to join table A and B. 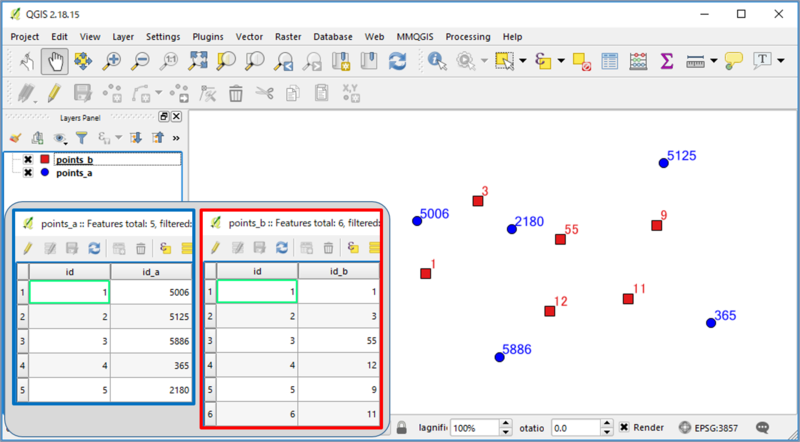 In "Distance matrix" chose: "Linear distance matrix" and "use only the nearest k target points: 1"
Load the CSV using "Add Vector Layer" and join the layers in Layer A's layer properties - join tab. The NNJoin Plugin should do the job. For each feature of the input layer it adds all the attributes of the nearest feature in the join layer and also adds a distance attribute with the distance to this feature. If you can live with just joining a single attribute from your "B" layer, take a look at the "Hub Distance" tool from the mmqgis plugin. If you need the rest of the "B" attributes, you should then be able to join the rest of your "B" attributes back to this layer. You can also optionally generate lines from the A to B if desired. This is helpful for visualizing the distances and directions between associated features. Another approach using refFunctions plugin. (2) Open an attribute table of the layer which has more features (points_b layer in this example) so that no pairs are missed out. Create new fields. Not the answer you're looking for? Browse other questions tagged qgis point attribute-joins or ask your own question. 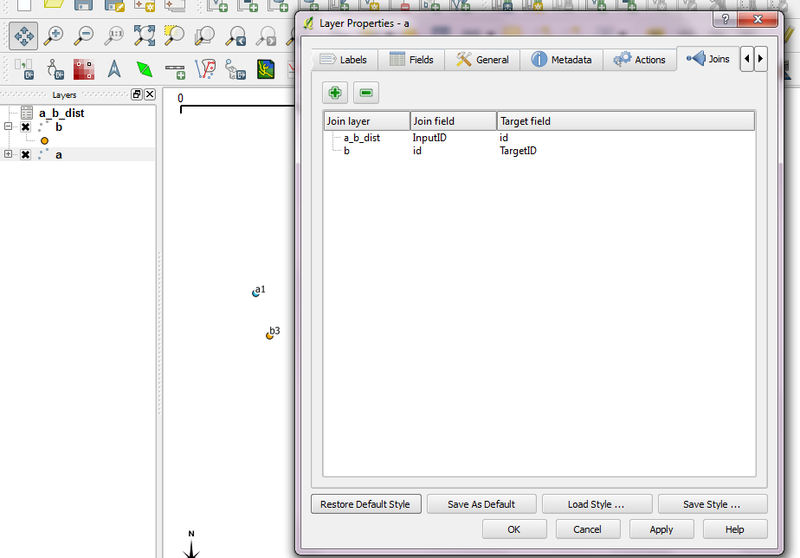 What are the units of the Distance Matrix tool results in QGIS? How to compare two sets of points in QGIS? How to consecutively number polygons from north to south following a polyline? Is there a way to run spatial join within tolerance? Reassigning raster values by looking for nearest pixel in another raster using QGIS? Joining by 'almost' identical attributes using QGIS?